Private transfer fees, also known as reconveyance fees, recovery fees, capital recovery fees, or resale fees, is a charge that is required to be paid to a developer, HOA, or individual at closing each time a property is sold. The transfer fee is attached to the property as a covenant and usually runs for a set period, often 20 or 99 years. While developers say it is a way to spread improvement costs over a longer period, opponents believe private transfer fees decrease affordability, increase potential liability, and provide no benefit to property purchasers of the community in which the property is located. In 2012, the Federal Housing Finance Agency (FHFA) issued a rule prohibiting the fees on mortgages handled by Fannie Mae, Freddie Mac, and the Federal Home Loan Banks. As of 2014, 43 states explicitly prohibit private transfer fees in most situations. Private transfer fees are different from impact fees, or development fees, which are expenditures that developers are required to make as a precondition to approval of their projects. Impact fees are generally used to finance roads, schools, affordable housing, transit systems, and other projects and services in municipalities throughout the United States. The fees are frequently passed on by developers to purchasers in the price of a new property and, therefore, increase the cost of housing and decrease the profitability of a particular project. According to the 2012 National Impact Fee Survey by Duncan Associates, average total fees charged by jurisdictions surveyed in 2012 are $11,583 for single-family units. Excluding utility fees, the average total fee is $8,111. 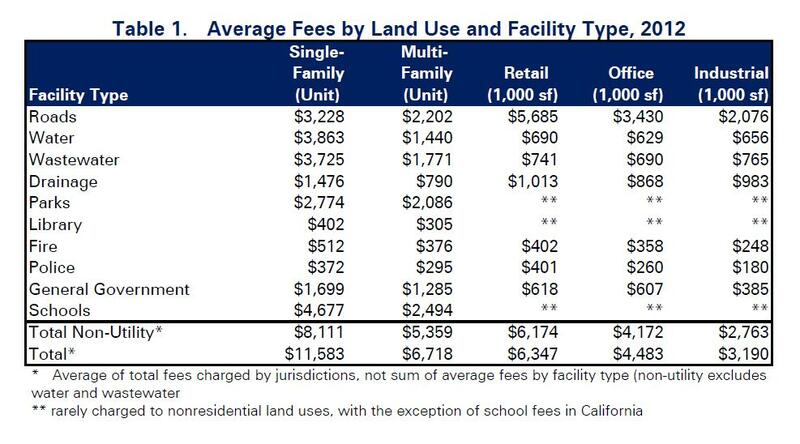 School impact fees, although not charged in many states, are the highest, followed by water, wastewater, road, and park impact fees. Police, fire and library fees, on the other hand, tend to be relatively low. General government facility impact fees and stormwater drainage impact fees are relatively uncommonly charged -- general government fees are not authorized in most states, and drainage fees are difficult to implement because they generally must be based on a comprehensive drainage master plan. REALTORS® can keep up with the latest state legislative activity surrounding private transfer and impact fees by accessing NAR's State Issue Tracker. This online database is available free to members and tracks legislative and regulatory actions at the state level on several issue of importance to REALTORS® and the real estate industry. 2012 National Impact Fee Survey, (Austin, TX: Duncan Associates, Aug. 20, 2012) — This report summarizes the results of a detailed survey of impact fees that individual jurisdictions across the country are charging. The results of the survey reveal where impact fees are most common, how much jurisdictions in various states are charging, and the types of facilities for which fees are being charged. Fannie Mae issued Selling Guide Announcement SEL-2012-05. This week, NAR and IREM sent an industry coalition letter to the FHA commissioner asking the agency to adopt a new private transfer fee rule. The Federal Housing Finance Agency (FHFA) released the final rule on private transfer fees.